For the last nine years, my mother and I have lived on opposite sides of the country. Though we don’t see each other often, we talk on the phone nearly every day. During one recent Saturday-afternoon call, she was eating lunch as we talked. I could tell by the occasional gentle clank that her spoon made on the side of the pot (she doesn’t believe in dirtying a bowl when the saucepan will do). Immediately I knew that I wanted in on this lunch-soup idea, and I asked for more details. 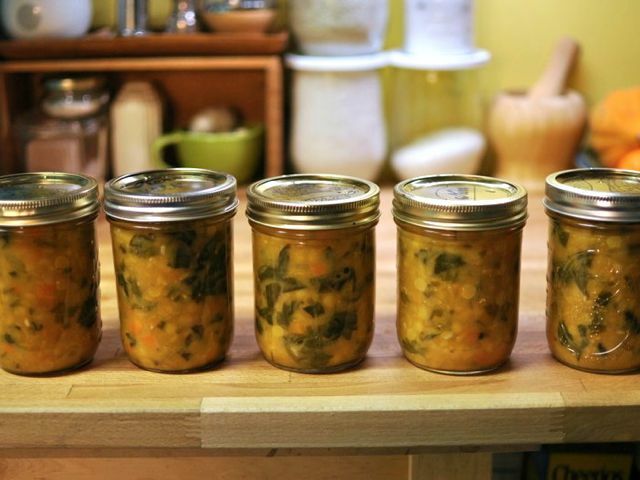 She explained that since winter settled over Portland, she’d been eating a lot of canned soup. However, each can was at least $1.50 a pop, and loaded with sodium. She determined to start cooking up a pot of soup at the beginning of the week, expressly for her lunches. Utter brilliance. I decided to copy everything about this habit, effective immediately. You see, I regularly struggle with what to eat in the middle of the day. Rarely do I have leftovers to bring to work with me, because my evening cooking falls into one of two categories: Either I cook just enough for my husband and me, or I cook enough to last us two full dinners. Somehow I’m not good at the middle ground. What’s more, during the warmer months I don’t mind bringing salad for lunch, but in the winter, the last thing I want to do is dive into a big container of cold crunchiness. A light, healthy, tasty soup was exactly what I needed. I’ve taken to cooking up a pot of this soup on Sunday evenings, while making dinner. It takes only a few minutes to get it started, and then it’s just a matter of scooting it to the back burner and letting it simmer while I turn my attention to the main meal. 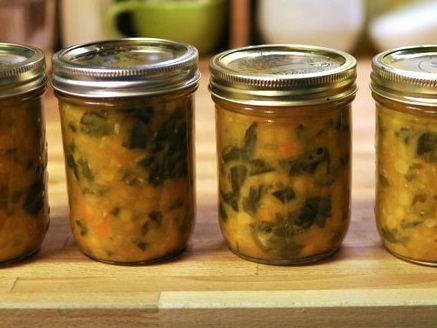 When it’s finished cooking and cool enough for the refrigerator, I take the lunch prep a step further and pack it up in a series of wide-mouth pint jars (the recipe makes exactly enough to fill five of them). This way, all I have to do in the morning is grab a jar, and lunch is made. Paired with a piece of fruit and a few almonds from the bag in my desk, it is an easy, filling, low-cost, low-waste, delectable midday meal.